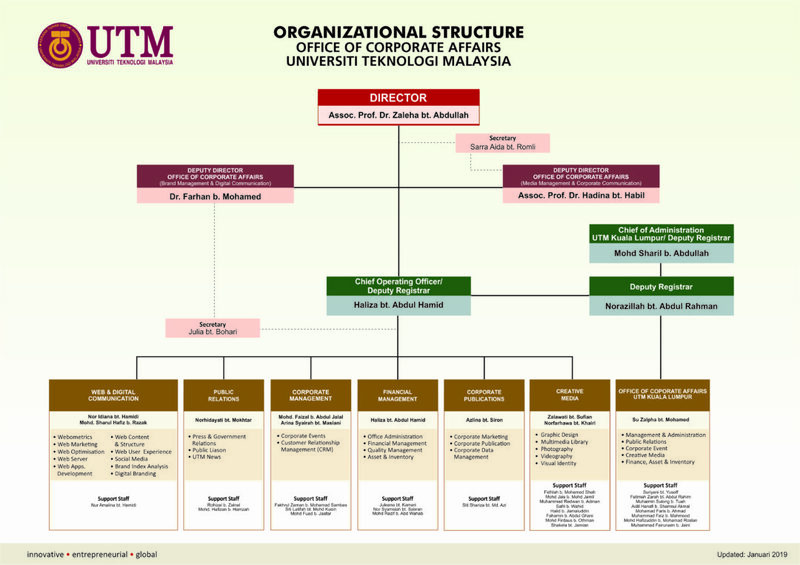 The Office of Corporate Affairs is a division within the Chancellery of Universiti Teknologi Malaysia (UTM), which supports the university top management in the university strategic corporate communication, public relation as well as media relation. Promote and manage the UTM Brand to internal and external community One Stop Centre for communication. Liason for organisational relationships and partnerships with external party. Produce internal and external publications, annual report, skudai post, etc. Coordinate, manage and handle Branding & Corporate publications/Corporate Marketing, university events, public, corporate and government relations, etc. To be an excellent centre for corporate affairs. To promote and uphold UTM’s image and reputation through strategic communication.